Mountain biking holidays have never been so popular and Sierra Nevada continues to be a Mecca for trail riders from all over the globe. Our guides have travelled far and wide in search of the perfect ride. We are constantly developing new routes and riding the best singletrack while having fun is still the main focus. Race some of the best MTB trails in Southern Europe!! Back again for 2018, on the 10th and 11th November. Find all the info about this year's Enduro Race, including dates, accommodation offers and route profiles! Ride Sierra Nevada is a dedicated mountain bike holiday company run by enthusiastic mountain bikers. Our aim is to provide the world wide mountain bike community with the perfect all year round big riding holiday. With trails to suit most types of mountain biker through all mountain, enduro, cross country and downhill we strive to make your holiday challenging, skill enhancing and most of all fun! Mountain biking holidays have never been so popular and Sierra Nevada continues to be a Mecca for trail riders from all over the globe. Our guides have travelled far and wide in search of the perfect ride and on return we all agree that what we have here in Sierra Nevada is world class mountain biking. Riding singletrack here since 2002 has given us unrivalled knowledge of the area which means you experience the best kept secrets as well as classic Sierra Nevada trails. We are constantly developing new routes and riding the best singletrack while having fun is still the main focus. If you want big mountain singletrack descents, epic climbs with a bit of tapas and sunshine on the side then look no further, bring your own bike or rent from our fleet we guarantee you an unforgettable ride. 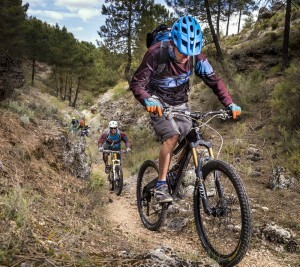 Ride Sierra Nevada is a product of Mountain Bike Granada. We are registered with the Andalucian Tourist board, comply with all insurance requirements and hold an Active Tourism licence no AT/GR/00102.